From the earliest periods of history until the beginning of the 19th century, fire was man's primary source of light. This light was produced through different means—torches, candles , oil and gas lamps. Besides the danger presented by an open flame (especially when used indoors), these sources of light also provided insufficient illumination. The first attempts at using electric light were made by English chemist Sir Humphry Davy. In 1802, Davy showed that electric currents could heat thin strips of metal to white heat, thus producing light. This was the beginning of incandescent (defined as glowing with intense heat) electric light. The next major development was the arc light. This was basically two electrodes, usually made of carbon, separated from each other by a short air space. Electric current applied to one of the electrodes flowed to and through the other electrode resulting in an arc of light across the air space. Arc lamps (or light bulbs) were used mainly in outdoor lighting; the race was still on among a large group of scientists to discover a useful source of indoor illumination. The primary difficulty holding back the development of a commercially viable incandescent light was finding suitable glowing elements. Davy found that platinum was the only metal that could produce white heat for any length of time. Carbon was also used, but it oxidized quickly in air. The answer was to develop a vacuum that would keep air away from the elements, thus preserving the light-producing materials. Thomas A. Edison, a young inventor working in Menlo Park, New Jersey, began working on his own form of electric light in the 1870s. In 1877 Edison became involved with the rush for a satisfactory electric light source, devoting his initial involvement to confirming the reasons for his competitors' failures. He did, however, determine that platinum made a much better burner than carbon. Working with platinum, Edison obtained his first patent in April of 1879 on a relatively impractical lamp, but he continued searching for an element that could be heated efficiently and economically. Edison also tinkered with the other components of the lighting system, including building his own power source and devising a breakthrough wiring system that could handle a number of lamps burning at the same time. His most important discovery, however, was the invention of a suitable filament. This was a very thin, threadlike wire that offered high resistance to the passage of electric currents. Most of the early filaments burned out very quickly, thus rendering these lamps commercially useless. To solve this problem, Edison began again to try carbon as a means of illumination. He finally selected carbonized cotton thread as his filament material. The filament was clamped to platinum wires that would carry current to and from the filament. This assembly was then placed in a glass bulb that was fused at the neck (called sealing-in). A vacuum pump removed the air from the bulb, a slow but crucial step. Lead-in wires that would be connected to the electrical current protruded from the glass bulb. On October 19, 1879, Edison ran his first test of this new lamp. It ran for two days and 40 hours (October 21—the day the filament finally burned out—is the usual date given for the invention of the first commercially practical lamp). Of course, this original lamp underwent a number of revisions. Manufacturing plants were set up to mass produce light bulbs and great advances were made in wiring and electrical current systems. However, today's incandescent light bulbs greatly resemble Edison's original lamps. The major differences are the use of tungsten filaments, various gases for higher efficiency and increased lumination resulting from filaments heated to higher temperatures. Fluorescent lamps are glass tubes that contain mercury vapor and argon gas. When electricity flows through the tube, it causes the vaporized mercury to give off ultraviolet energy. This energy then strikes phosphors that coat the inside of the lamp, giving off visible light. Mercury vapor lamps have two bulbs—the arc tube (made of quartz) is inside a protecting glass bulb. The arc tube contains mercury vapor at a higher pressure than that of the fluorescent lamp, thus allowing the vapor lamp to produce light without using the phosphor coating. Neon lamps are glass tubes, filled with neon gas, that glow when an electric discharge takes place in them. The color of the light is determined by the gas mixture; pure neon gas gives off red light. Metal halide lamps, used primarily outdoors for stadiums and roadways, contain chemical compounds of metal and halogen. This type of lamp works in much the same fashion as the mercury vapor lamps except that metal halide can produce a more natural color balance when used without phosphors. High-pressure sodium lamps are also similar to mercury vapor lamps; however, the arc tube is made of aluminum oxide instead of quartz, and it contains a solid mixture of sodium and mercury. Thomas A. Edison (center, with cap) with workers in his laboratory in Menlo Park, New Jersey. The photo was taken in 1880. More than twenty inventors, dating back to the 1830s, had produced incandescent electric lights by the time Thomas Edison entered the search. The 1870s was the crucial decade, as the technologies of production and the forces of demand combined to make the search for a commercially feasible electric light the high-tech, high-stakes race of the era. Edison had established his research laboratory in rural Menlo Park, New Jersey, midway between New York City and Philadelphia. The laboratory building and several outbuildings were constructed in 1876 with profits Edison had made with his telegraph inventions. He initially intended to take projects from any investor who wanted his help and to continue working on his own ideas in telegraph and telephone systems. He said he thought the laboratory could produce a new invention every ten days and a major breakthrough every six months. In 1877, Edison decided to enter the highly publicized race for a successful light bulb and enlarged his laboratory facilities with a machine shop and an office and research library. The staff grew from 12 to over 60 as Edison tackled the entire lighting system, from generator to insulator to incandescent bulb. Along the way, Edison created a new process of invention, orchestrating a team approach that brought financing, materials, tools, and skilled workers together into an "invention factory." Thus, the search for the light bulb illustrated new forms of research and development that were later developed by General Electric, Westinghouse, and other companies. One of the main components in a light bulb, the filament, is prepared by mixing tungsten and binder and then drawing the mixture into a fine wire around a steel mandrel. 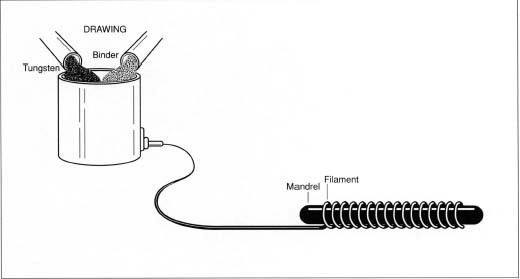 Aher heating the wire and then dissolving the mandrel with acid, the filament assumes its proper coiled shape. tungsten filaments can withstand temperatures as high as 4500 degrees Fahrenheit (2480 degrees Celsius) and above. The development of the tungsten filaments is considered the greatest advancement in light bulb technology because these filaments could be produced cheaply and last longer than any of the previous materials. The connecting or lead-in wires are typically made of nickel-iron wire (called dumet because it uses two metals). This wire is dipped into a borax solution to make the wire more adherent to glass. The bulb itself is made of glass and contains a mixture of gases, usually argon and nitrogen, which increase the life of the filament. Air is pumped out of the bulb and replaced with the gases. A standardized base holds the entire assembly in place. The base, known as the "Edison screw base," was originally made of brass and insulated with plaster of paris and, later, porcelain. Today, aluminum is used on the outside and glass is used to insulate the inside of the base, producing a stronger base. The uses of light bulbs range from street lights to automobile headlights to flashlights. For each use, the individual bulb differs in size and wattage, which determine the amount of light the bulb gives off (lumens). However, all incandescent light bulbs have the three basic parts—the filament, the bulb and the base. Originally produced by hand, the light bulb manufacture is now almost entirely automated. 1 The filament is manufactured through a process known as drawing, in which tungsten is mixed with a binder material and pulled through a die—a shaped orifice—into a fine wire. Next, the wire is wound around a metal bar called a mandrel in order to mold it into its proper coiled shape, and then it is heated in an process known as annealing. This process softens the wire and makes its structure more uniform. The mandrel is then dissolved in acid. 2 The coiled filament is attached to the lead-in wires. The lead-in wires have hooks at their ends which are either pressed over the end of the filament or, in larger bulbs, spot-welded. Virtually the entire light bulb manufacturing process is automated. The glass bulbs are blown by a ribbon machine that can produce more than 50,000 bulbs per hour. After the filament and stem assembly are inserted into the bulb, the air inside the bulb is evacuated and an argon/nitrogen mixture is pumped in. Finally, the base is sealed on. a furnace, a continuous ribbon of glass moves along a conveyor belt. Precisely aligned air nozzles blow the glass through holes in the conveyor belt into molds, creating the casings. A ribbon machine moving at top speed can produce more than 50,000 bulbs per hour. After the casings are blown, they are cooled and then cut off of the ribbon machine. Next, the inside of the bulb is coated with silica to remove the glare caused by a glowing, uncovered filament. The company emblem and bulb wattage are then stamped onto the outside top of each casing. 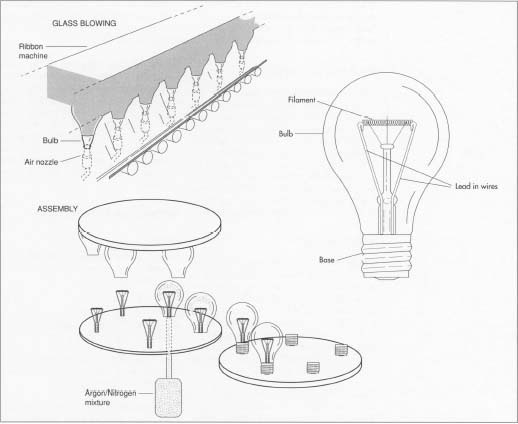 4 The base of the bulb is also constructed using molds. It is made with indentations in the shape of a screw so that it can easily fit into the socket of a light fixture. 5 Once the filament, base, and bulb are made, they are fitted together by machines. First, the filament is mounted to the stem assembly, with its ends clamped to the two lead-in wires. Next, the air inside the bulb is evacuated, and the casing is filled with an argon and nitrogen mixture. These gases ensure a longer-life for the filament. The tungsten will eventually evaporate and break. As it evaporates, it leaves a dark deposit on the bulb known as bulb-wall blackening. 6 Finally, the base and the bulb are sealed. The base slides onto the end of the glass bulb such that no other material is needed to keep them together. Instead, their conforming shapes allow the two pieces to be held together snugly, with the lead-in wires touching the aluminum base to ensure proper electrical contact. After testing, bulbs are placed in their packages and shipped to consumers. Light bulbs are tested for both lamp life and strength. In order to provide quick results, selected bulbs are screwed into life test racks and lit at levels far exceeding their normal burning strength. This provides an accurate reading on how long the bulb will last under normal conditions. Testing is performed at all manufacturing plants as well as at some independent testing facilities. The average life of the majority of household light bulbs is 750 to 1000 hours, depending on wattage. The future of the incandescent light bulb is uncertain. While heating a filament until it glows is certainly a satisfactory way to produce light, it is extremely inefficient: about 95 percent of the electricity supplied to a typical light bulb is converted to heat, not light. In a world with dwindling resources, where energy conservation is increasingly vital, this inefficiency may eventually make the incandescent light bulb impractical. There are other light sources already in use that could supplant the incandescent bulb. Fluorescent tubes, for instance, already dominate the industrial market, and undoubtedly they will find increasing use as a domestic light source as well. Fluorescent bulbs use at least 75 percent less energy than incandescent bulbs and can last twenty times longer. The recent development of "compact" fluorescent bulbs, which unlike the standard fluorescent tube can screw into a typical domestic lamp, may expand the domestic market for fluorescent lighting. Another recent development is the "radio-wave bulb," a bulb that creates light by transmitting energy from a radio-wave generator to a mercury cloud, which in turn produces ultraviolet light. A phosphor coating on the bulb then converts the ultraviolet light into visible light. Such bulbs use only 25 percent as much energy as incandescent bulbs, and they can last a decade or more. They are also completely interchangeable with incandescent bulbs. Friedel, Robert. Edison's Electric Light: Biography of an Invention. Rutgers University Press, 1987. Adler, Jerry. "At Last, Another Bright Idea." Newsweek. June 15, 1992, p. 67. Coy, Peter. "Light Bulbs to Make America Really Stingy with the Juice." Business Week. March 29, 1993, p. 91. Miller, William H. "The 20-Year Light Bulb Clicks On." Industry Week. November 16, 1992, p. 41. Pargh, Andy. "Light Bulbs Shed New Light." Design News. June 22, 1992, p. 164. Edison DID NOT invent or improve the incandescent lamp... He was beaten to it by a man not mentioned in your article: Sir Joseph Swann! They eventually collaborated and set up a joint venture known as EDISWAN... Swann provided the invention and knowledge, Edison provided the production skills. Why do Americans swamp written history with their version? Agree with Mr. Morgan. Joseph Swann invented the incandescent lamp in 1860. He improved it about 15 years later. Edison became involved in this research when he bought the rights to a similar invention patented by two men in Toronto. Edison's greatest contribution to the electric light was marketing. He was a master at promoting himself. This, after all, was the man who said: "If I didn't invent the incandescent lamp, then I invented nothing." Hmmmmmm.